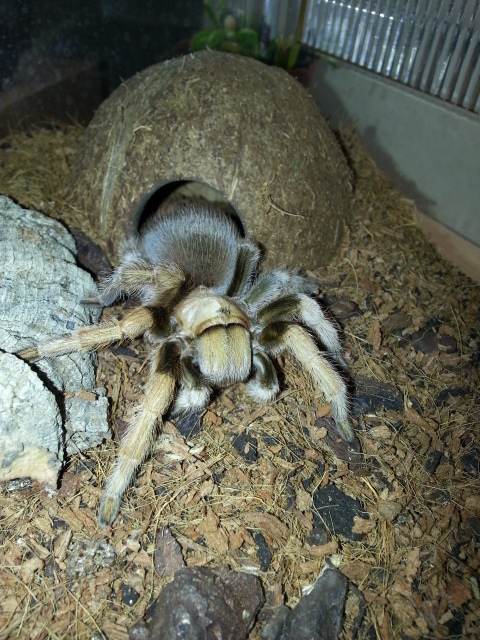 Custard is one of my many ‘babies’, my tarantulas. 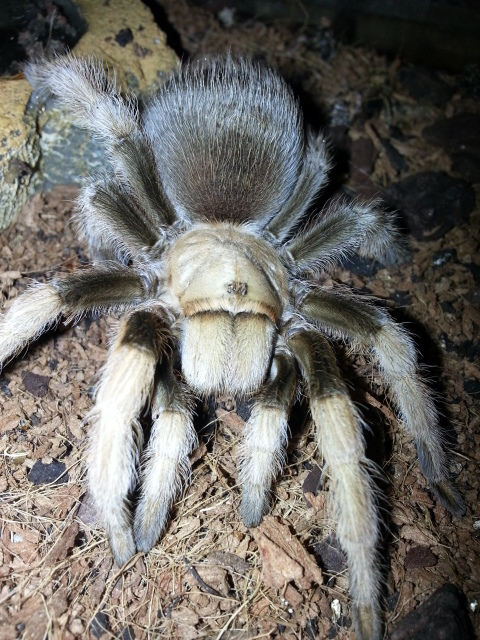 A Desert Blonde, Aphonopelma chalcodes, her species is native to Arizona and adjacent parts of Mexico, though Custard is captive bred. She came to me about 6 months ago and has appeared very comfortable since; eating at times, preferring to leave it at others. She doesn’t look or behave at all stressed. She has a coconut hide, she either uses it or she doesn’t. At colder times, some tarantulas might hole-up in the burrows, living off their fat reserves and appear at warmer temperatures. However, I was surprised this morning to find Custard completely webbed into her burrow. This is either because for some reason she is stressed, or she’s displaying habits associated with nocturnal behaviour or she may be gravid, in other words, preganant! Being gravid is highly unlikely because she’s had no nooky or contact with any other males! Some specimens hole up in daylight and emerge in the dark, or, there’s a molt on the way? Molting is when a tarantula will shed its exoskeleton to allow further growth. Needless to say, having had a few of the others molt recently, I’m a little excited for Custard. The only notable change is perhaps her abdomen does look a little larger than normal. She’s quite docile too so doesn’t tend to kick a lot of hairs, thus I can’t really see any darkening patches on her abdomen that might signify a molt is near. Now, as docile as she is, I took the opportunity to remove a bolus – uneaten or indigestible food – from her enclosure. Just as I grabbed the bolus with the tongs, out she shot, like lightning! She stopped and put on a really impressive threat display! Talk about surprise! Something’s going on but sadly by the time I grabbed my camera, she’s calmed down and put all front legs back on the ground. I managed to get the following picture and then, as if she had murmured, “huh!”, she turned slowly and headed back into her coconut! I’ll keep you posted and let you know of any, if any, occurrences. This entry was posted in My Words and tagged Aphonopelma, arizona, blonde, chalcodes, crawlies, creepy, desert, mexico, spider, tarantula. Bookmark the permalink.